Hello Kitty in Space: Japan's iconic mouthless cat is riding aboard the small satellite Hodoyoshi 3 and will beam messages from space as part of a 40th anniversary celebration by Sanrio Co., Ltd.
Hello Kitty, Japan's lovable feline toy, is now a cat-stronaut. Not only is the intrepid kitty orbiting the Earth in a small satellite, but she's ready to beam messages from space for fans. Images from Sanrio Co., Ltd., the company responsible for the cute pop culture cat, show Hello Kitty in space clutching a toy while stunning views of Earth fill a small window in the background. The Earth views are real, with Sanrio launching Hello Kitty as a passenger on the small nanosatellite Hodoyoshi 3 in June. A digital display sits above the window to show messages from Earth. "Hello Kitty is standing by to deliver your messages from space!" reads a message on Sanrio's space Hello Kitty website. Sanrio posted a YouTube video of Hello Kitty in space to launch the message campaign. The mission is part of Sanrio's 40th anniversary celebration for the toy this year. Sanrio representatives announced Hello Kitty's space mission on Tuesday (Aug. 12) and began taking submissions for "thank you" messages to a person's family or friends to be presented by Hello Kitty in space. The messages can be 180 characters long and in Japanese or English, but only 10 messages will make it to space. A selection committee will review the submissions and make a final decision on which messages have the right stuff. For the project, Sanrio company sent a 1.6-inch (4 centimeters) Hello Kitty aboard the Hodoyoshi 3, one of two satellites (Hodoyoshi 4 was the other) built by the University of Tokyo's Nanosatellite Center. The figure is riding in a compartment about 28 inches tall (70 cm), and about 20 inches wide and deep, according to a Sanrio statement. Hodoyoshi 3 launched from Russia on June 19 alongside 36 other satellites. The spacecraft's primary mission is to test space technology and snap high-resolution photos of Earth from space. 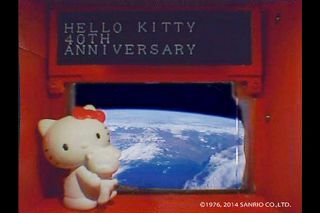 Hello Kitty enjoys a space ride in this still from a Sanrio Co., Ltd., YouTube video calling for submissions for messages from space to celebrate the 40th anniversary of Hello Kitty. According to a Reuters report, the Hodoyoshi 3 satellite is about the size of a trash can and is part of a larger $40 million project by Japan's education and science ministry to promote interest in science and engineering. Applications for Hello Kitty's space missions are being accepted through Aug. 25, and submissions can be sent in by people outside of Japan, according to Sanrio representatives. The messages will be transmitted from space between Aug. 26 and Sept. 8, and featured on the Hello Kitty 40th anniversary website, according to Sanrio representatives. Sanrio's Hello Kitty in Space mission isn't the first time the mouthless Japanese cat has ventured toward space. In 2013, seventh grader Lauren Rojas of Antioch, California launched a Hello Kitty doll into Earth's stratosphere as part of a science project at Cornerstone Christian School. In 2013, then-seventh grader Lauren Rojas of Antioch, California sent her Hello Kitty doll into Earth's stratosphere using a high-altitude balloon. The flight reached an altitude of 93,625 feet (28,537 meters) and captured amazing photos of Hello Kitty high above Earth.